Isaac Facio, textiles specialist at the Art Institute of Chicago, has been selected as Fermilab’s artist-in-residence for 2019. He will be the fifth artist to formally learn about science and research at America’s particle physics and accelerator laboratory. 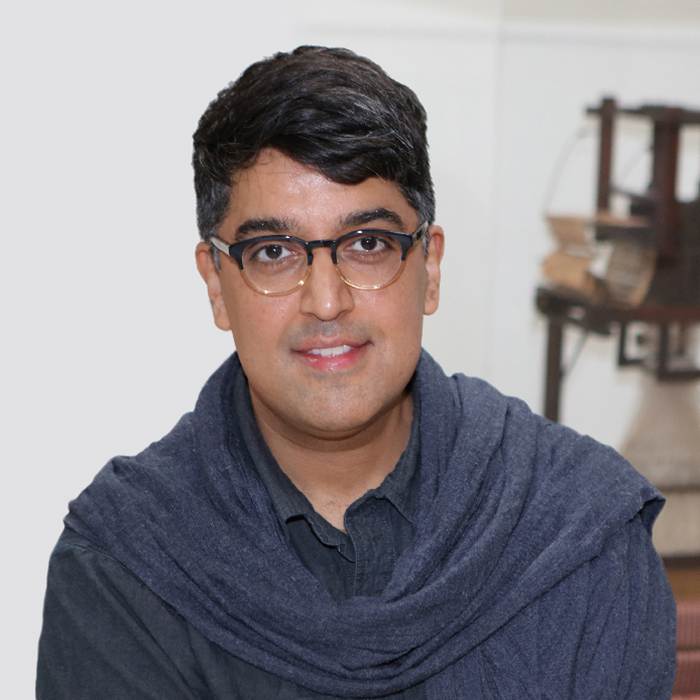 Facio draws on his background in textiles engineering and conservation to approach questions about the universe. 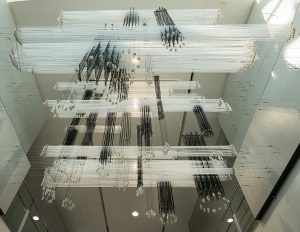 For his most recent exhibit, “The Fabric of the Universe,” Facio collaborated with Benedikt Diemer, a computational astrophysicist at the Harvard-Smithsonian Center for Astrophysics, to create a three-dimensional installation that represents the cosmic web, the filamentary structure of dark matter that permeates the universe. The exhibit was hosted by the Adler Planetarium from March to November 2018. Facio has worked at the Art Institute for most of his career. He started as a student at the School of the Art Institute, where he was an intern in textiles conservation. As a graduate student at the University of Manchester in the United Kingdom, he studied textiles technology and engineering. After graduate school, Facio joined the Art Institute’s Department of Conservation and Science, where he works today. Facio says that collaborations between art and science are important because of the commonalities in the questions pursued by their respective practitioners. He says artists and physicists can influence one another’s work by offering complementary perspectives on these questions. 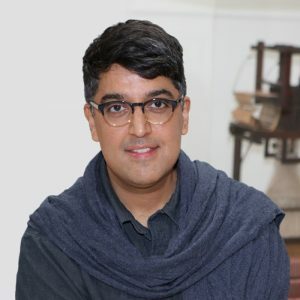 Facio calls himself a textiles specialist, rather than an artist, because his work incorporates training in textiles conservation, engineering and technology. As a textile conservator, he says, he brings a lot to the table, including his knowledge of textiles, textiles history and production. Weaving machines, such as the ones Facio uses to create his installations, can be thought of as tools for data output, he said. “When we think of them in this way, they can take us to unexplored places for data visualization,” he said. He says he wants to learn what he can from Fermilab researchers before developing a concept. Kathleen Kiefer, head of textiles conservation at the Art Institute, says Isaac Facio is an incredible asset to the Art Institute of Chicago and an enthusiastic advocate for textiles, science and technology. Fermilab launched the artist-in-residence program in 2014 to connect the laboratory’s science with new audiences through art. Oak Brook textiles artist Lindsay Olson was the first artist-in-residence in 2014. Chicago multimedia artist Ellen Sandor held the position in 2016, and sculptor Jim Jenkins was in residence in 2017. Photographer Adam Nadel of New York was the 2018 artist-in-residence. Georgia Schwender, the curator of Fermilab’s art gallery, said Isaac thinks about the world differently and stood out among the artists who applied for the residency.